The answer was so innocent, so Spiethian. With any other golfer, those words would have been next to a black “redacted” rectangle in the official transcript. A look of concern spread across Spieth’s face. The idea that some sexual or pharmacological event might have happened beside that pool … He stepped off the stage and walked toward the reporters. The reporters roared with laughter. Then I followed Spieth into interview areas. Media access to Spieth has been curtailed to the point where all but a few interactions are handled in group press conferences. But even reporters reduced to the cattle call claim it’s a good experience, thanks to Spieth’s likability. This is where the Nice Young Man goes to work. An athlete explaining what just happened on the field usually gives a reporter the simpleton’s version. (“I was looking for a pitch to hit.”) Spieth is a natural wonk and drowns the press in detail. Golf writers like to talk about the time Spieth spent about 30 minutes feeding the press after his Masters victory in April, and then offered a frighteningly comprehensive hole-by-hole recap of the final round — not just birdies and bogeys, like most golfers. It was, as strange as this sounds, like he was trying to impress them. 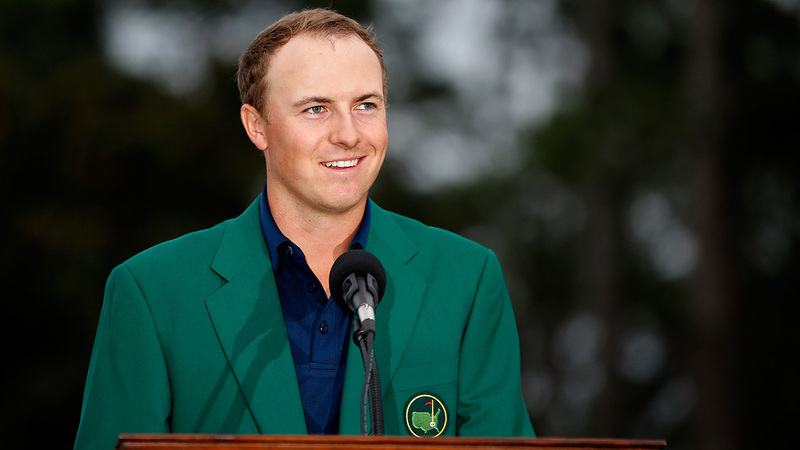 Spieth is a natural pleaser on the podium but not a yes man. He will gently push back against leading questions, especially those in which the reporter deposits the article’s thesis in his lap. No, he told a writer at the Masters, Augusta’s slick greens didn’t remind him of the greens of his Dallas youth. No, he said at the British Open, the “real” Open doesn’t start when the weather turns bad. Rory McIlroy — who, five minutes ago, was the world’s golf prodigy — can also command a press conference. McIlroy is more emotional and off-the-cuff; Spieth is more earnest and thoughtful. (The cameras love McIlroy; the notebooks love Spieth.) Golf writers have also watched McIlroy’s and Spieth’s styles converge. McIlroy, stung by negative stories and the pressure of being no. 1, has become more guarded; Spieth, newly confident with two majors, has gotten more expansive and eager to please. Although Spieth is not very “meta,” golf reporters suspect he has an innate understanding of the kind of morsels the media wants. Nothing illustrates this quite like the heart-rending quest of Ben Everill. Everill is an Australian AP reporter whose Twitter bio says he dishes the “inside oil” on Aussie golf. Before the Masters, the home office wanted Everill to ask Spieth just how important his win at the 2014 Australian Open was in kick-starting his run. Everill asked; Spieth answered. Mission accomplished. Then Everill was required to ask the same question after the Masters, as Spieth was basking in the first major win. 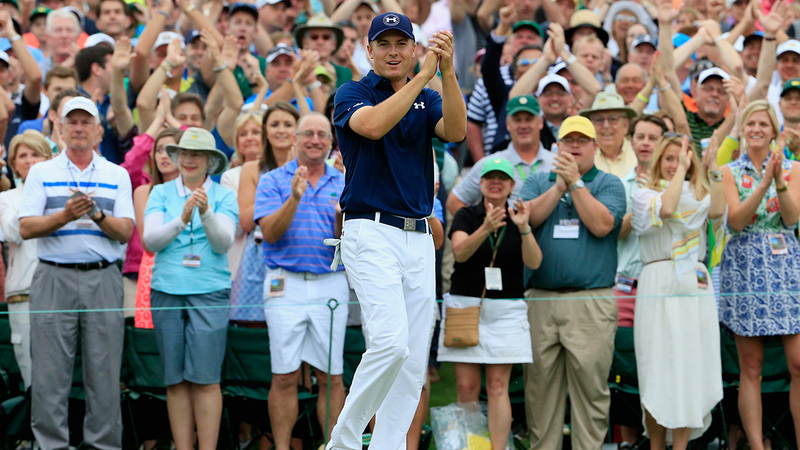 Spieth smiled and again paid homage to the Australian Open. The Aussie appetite for quotes about the 2014 Australian Open knows no bounds. 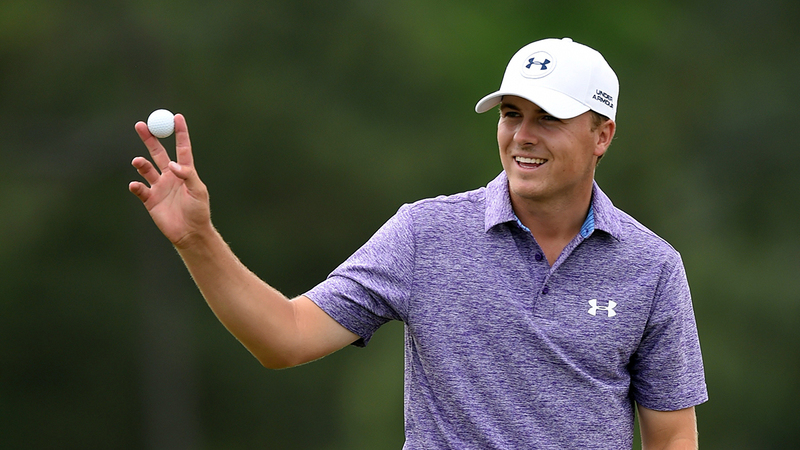 At the U.S. Open in June, Everill again had to ask Spieth the same question. And again at July’s British Open. Last week, in Akron, Everill apologized and repeated the question for at least the fifth time since April. Spieth answered — first gently pushing back on the premise (his Masters victory was a bigger kick-starter), before dishing enough inside oil that Everill was able to cut Spieth a break at this week’s PGA Championship. In the hours he has spent in press tents and walking near live mics on the course, Spieth has said a tiny number of things that would arouse even the most sensitive sportswriting soul. You often read that Spieth says “all the right things” to the media. This is a compliment against interest, because an athlete saying all the right things isn’t saying anything at all. But the golf writers say they’re not as bothered by his rigid niceness as they would be with another golfer. That’s because they don’t think there’s much of a difference between the public and private Spieths. The nice guy who says all the right things is not a media dissembler but the genuine article. The writers have theories about where Spieth acquired his maturity. The most popular is that he derived his patience by caring for his sister, Ellie, who has a neurological disorder. The golf writer John Feinstein goes one step further: It was volunteering at Ellie’s school — that is, with kids who weren’t his sister; kids he didn’t have to spend time with — that gave Spieth his forbearance. To understand the media’s love affair with Spieth, you have to look at the golfer who didn’t even get an invite to the Bridgestone. 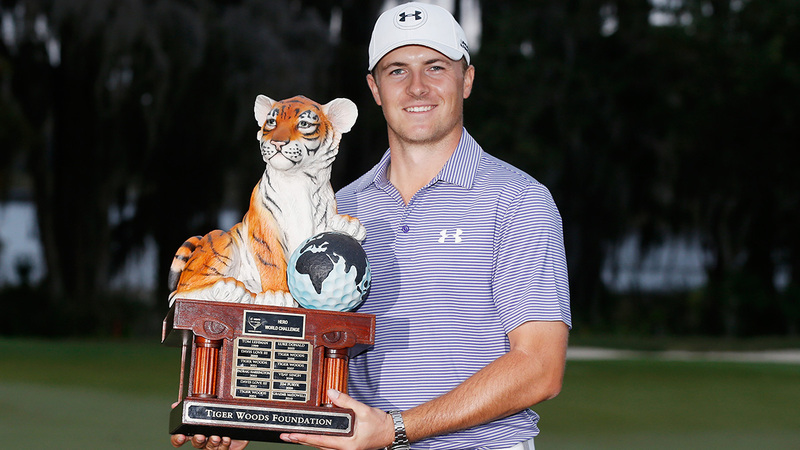 Writers may call Spieth an “heir to Tiger Woods,” but they mean it only in the golfing sense. The media loathes Tiger, and hopes Spieth will restore press-tent relations to its chummier, pre-Tiger state. “Golf writers through the years — and I go back even before my time — we’re spoiled,” said Feinstein. “You had Palmer, who was arguably the most cooperative athlete with the media ever. [Jack] Nicklaus learned from Palmer and evolved into somebody who was very good to deal with. [Tom] Watson ran hot and cold, but he could be very good. This is the press tent Spieth walked into. Kindred noted that Jack Nicklaus got an early stiff-arm in part because he was shoving Palmer, the reporters’ favorite son, off the winner’s podium. Spieth, on the other hand, was only shoving Woods further off the podium. The reporters felt like he was doing them a favor. What began as a comparison of the way Spieth and Woods handle the press has broadened into a critique of their characters. Spieth, nearly every profile mentions, is still dating his high school sweetheart, Annie Verret. “Annie’s good for Jordan,” his mom told the New York Times. “He doesn’t need a celebrity girlfriend.” Whereas Woods is a famous divorcee and, to borrow Dan Jenkins’s priceless phrase, a silicone collector. Spieth reaches into his bag for “arguably.” The word works like a police spike strip to puncture any excitement Spieth might accidentally generate. After winning the Masters, he declared, “This was arguably the greatest day of my life.” After winning the U.S. Open at Chambers Bay, Spieth noted that his caddie, Michael Greller, had been married at the course years earlier: “[Greller] shares arguably one of the best moments of his life here.” It’s a Nice Young Man’s tic, even if Greller’s wife wouldn’t appreciate the caution. Spieth is a realist. He knows he lost the 2014 Masters. Last week, he was still stewing over it — in an endearing way, of course — at his Akron press conference. There are so many reasons to rail against Augusta National, with its mono-racial audience, its elitism and the sense of the smiling outward face disguising levers being pulled within. But to have visited this place for the first time these past seven days has been to return to a purer, more understated, less cynical version of sport, one the fast-running world had seemed to have left behind. Spieth has been its epitome, though the sense of beautiful simplicity has reached well beyond his words and deeds. Not even Spieth’s putter is that good. Some of this is just the sportswriting circle of life. Spieth is flawless … until we can feast on more interesting stories: his first spat with the media (“Crossing Jordan”), his midcareer slump (“Err Jordan”), and then the inevitable Mickelson-like dotage, in which the press roots for him to use his sly skill to win one last major (“Wisdom Spieth”). It’s one thing to let Spieth cast a moral glow over the rest of the leaderboard. But by fetishizing his goodness, we imply that a golfer who swears a lot, who occasionally blows off the press, and who wouldn’t mind dating Kendall Jenner is a bad guy. There are golfers like that on the sport’s Mount Rushmore. In its fragmented, post-Tiger state, the PGA Tour has become a fascinating study in identity politics. “Jordan Spieth has this audience,” Kerr-Dineen said. “Rory McIlroy has Europeans. Bubba Watson has Southern guys. It’s almost like wrestling, where everybody can pick a guy they identify with. Hold my steno pad, will you? I want to climb up onstage and look through Jordan Spieth’s eyes. To find out what he gets out of his relations with the press. Admiring stories? Endorsement cash? That’s a start. But there’s something more primal here, too. Spieth belongs to a subcategory of Nice Young Men: He’s a Nice Young Texan. I was one once, too, and still can be when required, like when I see Mom’s friends across the room in a Tex-Mex restaurant. “To give everybody else a chance,” Spieth said, finishing the joke. As if on cue, Spieth added: “Don’t quote me on that.” For if there’s anything a Nice Young Texan doesn’t want, it’s for his niceness to be revealed as a front. The integrity of the artifice — if that’s the right term — is everything. During the ascendance of Jordan Spieth, a question has floated through the mind of nearly every golf writer: Could Spieth really be this abominably nice? Is it all a show? He isn’t acting, unless it’s Method acting. What Spieth gets out of his love affair with the golf media is no less than a fulfillment of his birthright. In Akron, I found myself in the position of a pro admiring another’s work. Yessir, I thought, that is a Nice Young Man, telling ’em what they want to hear and relishing the applause. The Defense Can’t Rest: Can Cal’s Porous D Improve Enough to Support the Ferocious Offense?